The 2011 Volvo S60 and V60 Sportswagon get the R-Design treatment — not to be confused with the regular "R treatment" or anything that adds substantial performance. Their Chinese overlords are happy enough with suspension tweaks and aesthetic unimprovements. 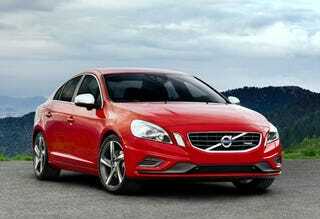 With the new S60, Volvo's somehow created a design as distinct as it is beige. The new R-Design version pushes the car barely into the third dimension of unsightly with a mere redesign of the nose. Perhaps it's the photo, but flat dark silver plasticky inserts weren't what was missing. The rear on the V60 fairs a little better with a standard-looking diffuser and twin tailpipes. As for the suspension, Volvo actually goes through the trouble of explaining what most would merely write off as "sport-tuned" before moving on to the real improvements. But these are the real improvements. Strut braces are added to the front/rear, as are shorter and stiffer springs, monotube shocks, and firmer bushings. The traction control also gets upgraded to let you have slightly more — but still responsible — fun. Pair this with the 304 hp gasser and you've got something that might compete with a V6 Acura TSX — in both ungainly looks and performance — and, just maybe, keep up with the a BMW 335i for a few moments — in performance only. But pair it with the 150 HP inline-four and all you've managed to do is spend a lot of money just to get embarrassed by a mum in a Lacetti.